I have not posted any cupcakes in a very long time. But I have to confess I've not been baking many cupcakes. Sadly, I think I've lost my cupcake mojo. To help me get back into the swing of things, I baked some Spring Time Cupcakes. I used a new recipe and whipped up one of my feathered fruit frosting and decorated with sprinkles and candy. The cupcakes were delicious and did not last long at all which was a good thing being it was a very hot and humid 90 degree day. I arranged the cupcakes and went to get my camera and when I returned the frosting was beginning to collapse. OH NO...but that's what happens to any frosting on a hot, humid day. One solution to collapsing cupcakes is to eat them...eat them very fast! 1. Cream butter and sugar until smooth. 3. Sift together flour, baking powder and salt and add to wet ingredients. Beat on low speed until well blended. 4. Pour into paper-lined regular size muffin tins filling about each liner about 2/3 full. 5. Bake about 20 minutes or until the cupcakes test done (do not over bake as they will be dry). 6. Immediately remove from pans. 7. Cool completely before frosting. To make pulp: Cut fruit from pit of plum. Put fruit in blender or food processor and process until smooth and peel is minced as finely as possible. In a small sauce pan heat pulp until it thickens to the consistency of thick ketchup. Strain through a fine mesh strainer. Cool. Put in refrigerator until completely chilled. To make frosting: Combine butter, salt, 2 tsp chilled pulp and cream cheese in mixer and beat on medium speed 2-3 minutes. Add sugar until just incorporated. Don’t over mix. It should be thick but not fluffy. Add vanilla. Wow, sounds great, love the addition of plums. Oooh, plum frosting. I'd have never have thought of that, sounds really interesting. Check out my latest blog post. I tagged you! those are the prettiest cupcakes! Plum frosting! Swoon! I have never tried that before, but it would be great on my vanilla cupcakes. I usually make a plain cream cheese frosting for them, but this I have got to try. What a wonderful idea. And, your cupcakes are absolutly adorable. I can't remember the last time I made cupcakes. Such fun little baked sweets! I'll have to get to fixing that. Oh My !!! I can not wait to make !! You are the Bomb !!! Awesome !! Adorable!!! I would have been happy to help you eat your collapsing cupcakes! Plums in the frosting - this sounds really delicious. 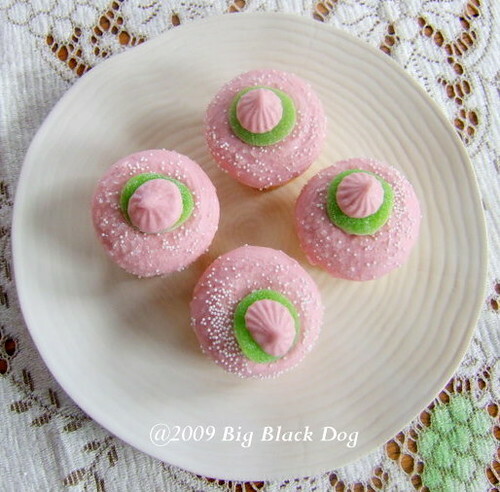 I love the way you have presented and decorated the cupcakes, the pink is so adorable. These cupcakes will certainly get the "ooohhh" and "aahhhs" in any little girl's birthday party. DARLING! I'm completely drawn to these cupcakes, sinking or not :) What a cool frosting you created too! 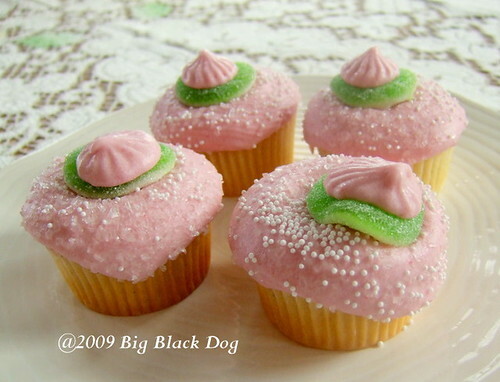 These Spring cupcakes look fabulous...with plum frosting...yummie! I can only imagine how it taste. Nice pictures. Ooh, I've never had plum frosting before. It looks and sounds delicious and very unique. Perfect sweet springtime treats! Your cupcakes look lovely. The pink color is wonderful. And here I was thinking, "Wow, how did she get her icing to hang like that...I love that look!" LOL. I thought it looked really artsy and unique, etc. Gorgeous colors, very pretty. Whisk Wednesday -- Catching UP!